by Dr. Erica Brown A must read for all synagogue leaders. Drawing on the past and looking to the future, this practical guide provides the tools you need to work through important contemporary leadership issues. 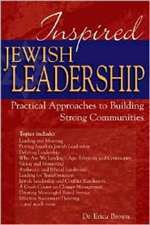 It takes a broad look at positions of leadership in the modern Jewish community and the qualities and skills you need in order to succeed in these positions.